Go to Size - 3 1/4" • 3 1/2" • 3 3/4" • 4" • 4 1/4" • 4 1/2" • 4 3/4" • 5" • 5 1/4" • 5 1/2" • 6"
3 1/4” snaffle mouthpiece with 4” cheeks. Too cute bit for miniature horses or tiny ponies! 3 1/2” snaffle mouthpiece with 4” cheeks. Too cute bit for miniature horses or tiny ponies! 3 3/4” snaffle mouthpiece with 5 1/4” cheeks. Great bit for miniature horses or tiny ponies! 3 3/4” jointed snaffle mouthpiece with 5” cheeks. Great bit for miniature horses or tiny ponies! Sticker says Made in China, but brand unknown. 3 3/4" or tight 4” jointed snaffle mouthpiece with 5 1/4” cheeks. Mouthpiece measures 3 3/4" inside bulb to inside bulb or a tight 4" inside cheeks. Great for Mini horses or small ponies. Brand unknown. 4 1/4” cheeks. Great for Mini Horses or Small Ponies. 4” snaffle mouth Full Cheek with 5 1/2” cheeks. 1 cheek slightly bent, may have been made that way. Full cheek snaffle bit with 4” jointed snaffle mouthpiece with 5 1/4” cheeks. Great for miniature horses or small ponies. Brand unknown. 2 available. Add a pair of bit loops/keepers, look under English Bit Accessories. 4” jointed snaffle mouthpiece with 5 1/4” cheeks. Great for Miniature horses or small ponies. 4” jointed snaffle mouthpiece with 4 1/2” cheeks. Great for Mini horses or small ponies. Brnad unknown. 4" 3-pc copper jointed snaffle mouthpiece with flat center link & 6 1/2” cheeks. Measures 4" inside bulb to inside bulb(tagged as a 4") or 4 1/4" inside cheeks. Full cheeks help with lateral control of the head. The 1 1/2" long Dr. Bristol plate at center applies tongue pressure when needed & the slow twist contacts bars for more control. The use of copper promotes salivation for a softer mouth. New with tag but brand unknown. 4” jointed snaffle mouthpiece(measured inside cheeks) with 5” cheeks. Great for Mini horses or small ponies. 4 1/4” jointed mouthpiece Full Cheek snaffle bit. 4 1/4” snaffle mouthpiece with 6 1/4” cheeks. When used with bit keepers, longer cheeks give more leverage. 4 1/4” jointed mouthpiece Full Cheek snaffle bit with 5 3/8” cheeks. 4 1/4” jointed snaffle mouthpiece with textured surface & 5 1/4” cheeks. Measures 4 1/4" inside bulb to inside bulb or 4 1/2" inside cheeks. The blunt edges of a Corkscrew bit amplify pressure on the mouth, especially the bars and tongue, so is good for those that pull or lean on the bit. 4 1/2 ” Full Cheek Snaffle Mouthpiece, 6” cheeks. 4 1/2” Full Cheek Snaffle Mouthpiece, 5” cheeks. 4 1/2” Slow Twist Snaffle mouthpiece, 5 1/2” cheeks. 4 1/2” jointed snaffle mouth Full Cheek with 6 1/4” cheeks. 4 1/2” Double Twisted Wire Snaffle Mouthpiece, 7” cheeks. 4 1/2” twisted wire jointed snaffle mouthpiece with 5 3/4” cheeks. Not marked but similar to a Never Rust bit made out of a nickel brass alloy, which stimulates salivation for a moist & responsive mouth. Twisted wire gives more bite to the mouthpiece for those who need a little more control or to stop horses from leaning on the bit. Use with bit loops for more leverage. Bit loops for sale separately, see BLP1. Some tarnish on bit. 4 1/2” Full Cheek Snaffle Mouthpiece, 6” cheeks. Minor chews to mouthpiece, but not rough. 4 1/2” jointed snaffle mouthpiece with 6 1/2” cheeks. 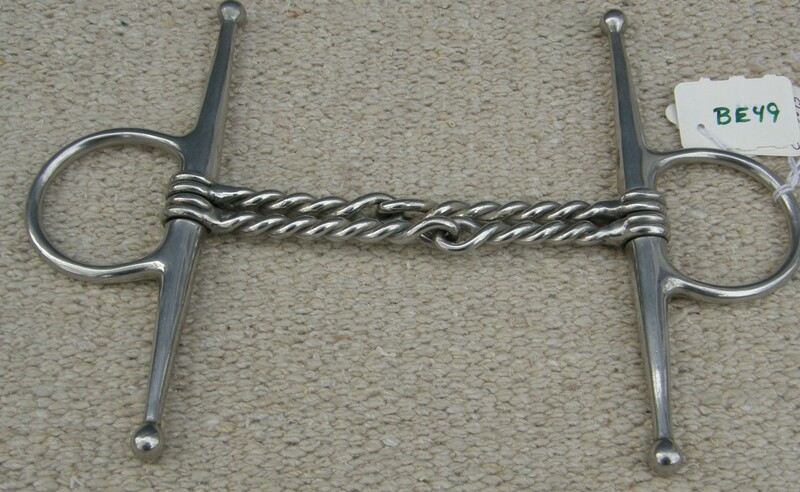 A heavy snaffle bit, good for high headed horses. Use with bit loops for added leverage, see BLP1. 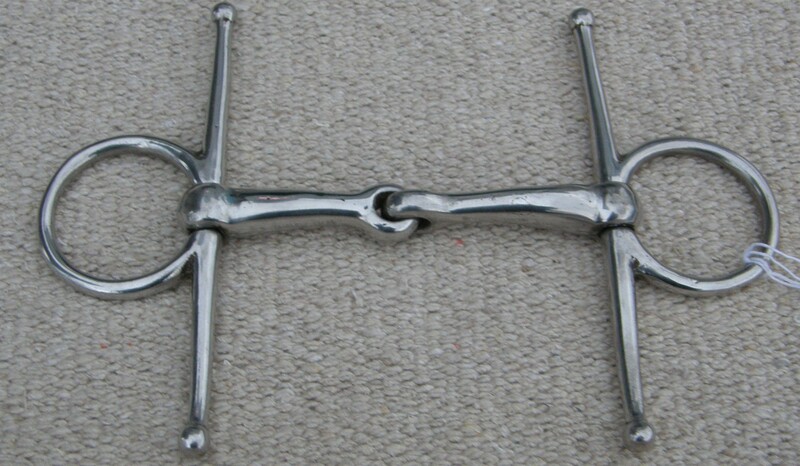 Vintage 4 1/2” Full Cheek Snaffle Bit Never Rust? 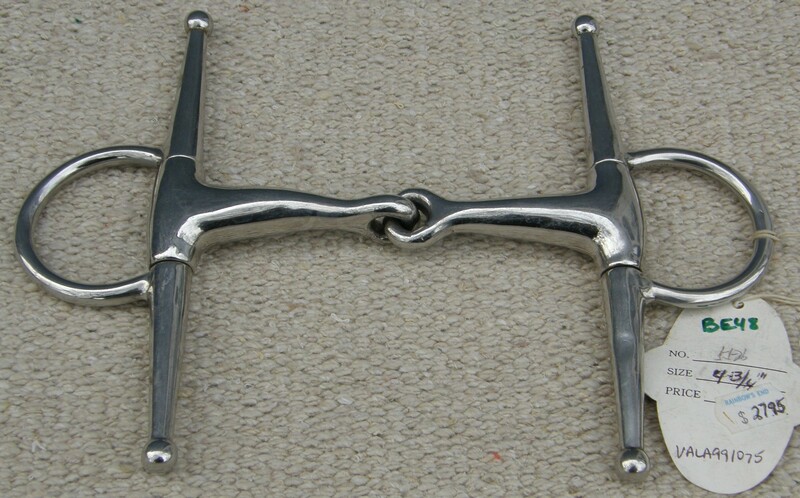 Vintage 4 1/2” narrow jointed snaffle mouthpiece with 6 1/4” high cheeks. Metal is very brassy looking, similar to Never Rust, but is not marked. 4 1/2” twisted wire jointed snaffle mouthpiece with 6 3/4” cheeks. Twisted wire gives more bite to the mouthpiece for those who need a little more control or to stop horses from leaning on the bit. Use with bit loops for more leverage. Bit loops for sale separately, see BLP1. 4 1/2” 3 sided jointed snaffle mouthpiece with 5 1/4” cheeks. Edges are blunted, not knife edged. Great for a horse who tends to lean on a bit, giving you more control without too much bite. 4 1/2" 3-pc jointed snaffle mouthpiece with flat center link & 5 1/4” cheeks. Full cheeks help with lateral control of the head. The Dr. Bristol plate at center applies tongue pressure when needed & the slow twist contacts bars for more control. The use of copper promotes salivation for a softer mouth. A few chew marks on center plate but nothing is rough. 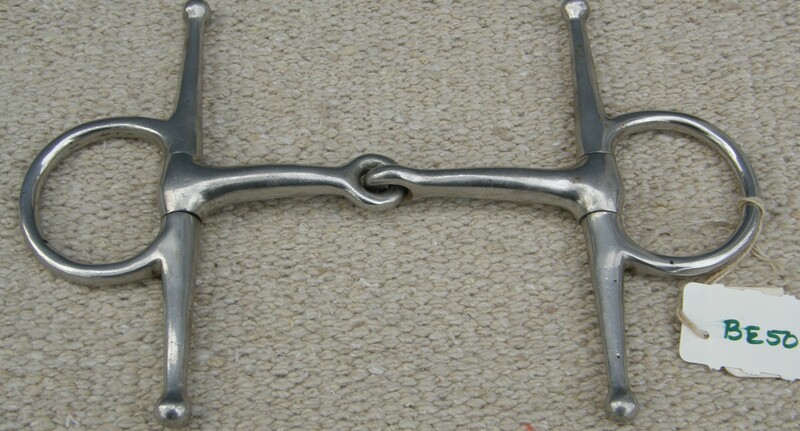 Vintage 4 1/2” jointed snaffle mouthpiece with 6 1/4” high cheeks. Measures 4 1/2" inside bulb to inside bulb or 4 3/4" inside cheek to inside cheek. Lots of scratches/chew marks on mouthpiece, but nothing is rough & cheeks look slightly bent. Stamped Made in England on mouthpiece, so would be a Never Rust or possibly a Kangaroo bit, but just barely seen. 5" twisted wire jointed snaffle mouthpiece with almost 6” cheeks. Mouthpiece measures 4 1/2" inside bulb to inside bulb or 5" inside cheeks. Twisted wire gives more bite to the mouthpiece for those who need a little more control or to stop horses from leaning on the bit. Brand unknown. Use with bit loops on these longer cheeks with give you more leverage. Bit loops for sale separately, see BLP1. Jointed snaffle mouthpiece with 5” cheeks. 4 3/4” snaffle mouthpiece with 5 1/4” cheeks. 4 3/4” Full Cheek jointed Snaffle Mouthpiece, 6” cheeks. Mouthpiece has lots of chew marks to top surface only, but is not rough. 4 3/4” Full Cheek Snaffle Mouthpiece, 7” cheeks. Extra long cheeks give slightly more leverage than shorter cheeks when using bit loops/bit keepers & give more pull to sides of face without risk of pulling bit through horses mouth. 4 3/4” snaffle mouthpiece with 6 1/2” cheeks. When used with bit keepers, longer cheeks give more leverage. 4 3/4” Hard Rubber Snaffle Mouthpiece with 6 1/4” cheeks. Minor scuffs to rubber but no gouges nor rough spots. 4 3/4” copper twisted wire jointed snaffle mouthpiece with 6” cheeks. Copper mouthpiece stimulates salivation for a moist & responsive mouth. Twisted wire gives more bite to the mouthpiece for those who need a little more control or to stop horses from leaning on the bit. Use with bit loops for more leverage. Bit loops for sale separately, see BLP1. 4 3/4” corkscrew textured jointed snaffle mouthpiece with 7” cheeks. 4 3/4” snaffle mouthpiece with 6 1/2” cheeks. 4 3/4” jointed snaffle mouthpiece with 6 3/4” cheeks. 4 3/4” jointed snaffle mouthpiece (measured inside bulb to inside bulb) with 6 3/4” full cheeks. Extra long cheeks give slightly more leverage than shorter cheeks when using bit loops/bit keepers & gives more pull to sides of face without risk of pulling bit through horses mouth. Rounded tips of top cheeks point away from horse to prevent poking. A fairly heavy bit. Stamped on mouthpiece Stainless Steel, Made in England, & what looks like Eldonian. 4 3/4” jointed snaffle mouthpiece(measured inside cheeks) with 6 1/2” cheeks. Use with bit loops on these longer cheeks with give you more leverage. Bit loops for sale separately, see BLP1. The Fulmer full cheek is similar to the regular full cheek in that it has an upper and lower cheek, which taper off as they move from the mouthpiece. However, the ring to which the bit is attached is not an Eggbutt or D-ring design, but a loose ring. This bit therefore gives the lateral guiding effect of the full cheek, without the rigidity of many other bit rings & reduces the risk of being pulled through the mouth. 4 3/4” jointed snaffle mouthpiece with 2 3/8'' diameter rings, 3/4” diameter mouth at thickest point and 6 1/4'' cheeks. Very heavy bit, great for encouraging horse to keep head down. Minor light chew marks on mouthpiece, some tarnish throughout. Stamped Never Rust Made in England on mouthpiece. 4 3/4” jointed snaffle mouthpiece with textured surface & 6” cheeks. Mouthpiece measured inside cheek to inside cheek. The blunt edges of a corkscrew bit amplify pressure on the mouth, especially the bars and tongue. Brand unknown, is new with plastic "string" from tag but no tag. 4 3/4” slow twist jointed snaffle mouthpiece with 6” cheeks. Brand unknown. Use with bit loops BLP1 for more leverage. 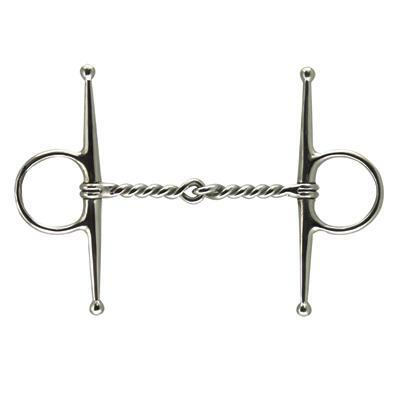 4 3/4” or tight 5" twisted wire jointed snaffle mouthpiece with 7” cheeks. Mouthpiece measures 4 3/4" inside bulb to inside bulb or 5" inside cheeks. Twisted wire gives more bite to the mouthpiece for those who need a little more control or to stop horses from leaning on the bit. Brand unknown. Use with bit loops on these longer cheeks with give you more leverage. Bit loops for sale separately, see BLP1. Full cheek snaffle bit with 3/8" twisted wire jointed snaffle mouthpiece & 6 7/8” cheeks. If you measure inside cheeks it is 5", if you measure just inside of each bulb it measures 4 3/4". Depends how tight you want this on your horses lips. Great to keep heavy horses lighter & more responsive to your hands. A bit for experienced riders.